The following recipe from Chef Paul Kasten appeared in our November 2015 issue. Find it on newsstands now, and subscribe today to have All About Beer Magazine delivered straight to your door. Fresh sweet corn is one of my favorite produce items of the year. This is a simple dish, but with great product and solid technique, it can be delicious and refined. The sweet and starchy flavors naturally complement the malt profile of pale ale- and lager-based pepper beers, but it has enough flavor to make a nice contrasting pairing with darker examples. 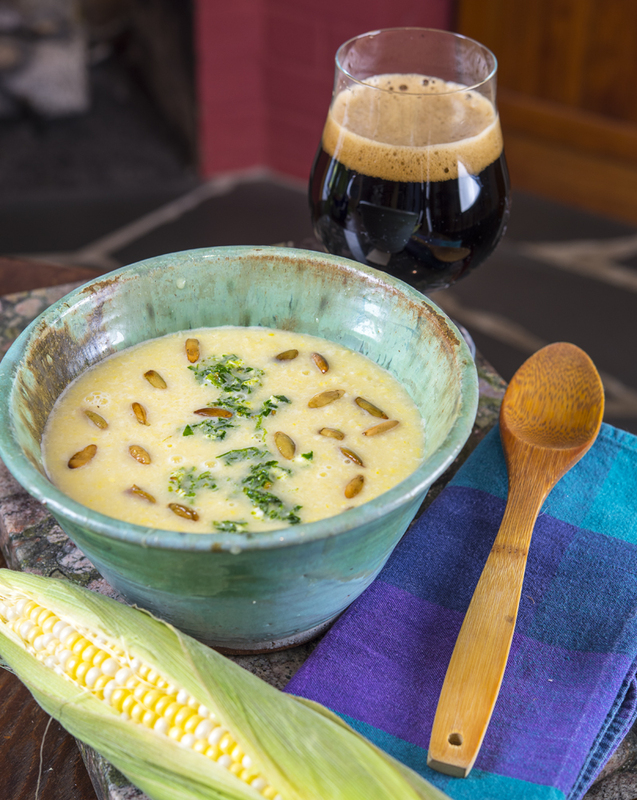 Corn’s sweetness and creaminess round out capsaicin heat in pepper beers, bringing more nuanced flavors forward. Paired with pale examples of the style, green and herbal garnishes complement vegetal pepper notes and hop flavors. Paired with darker, more malt-driven pepper beers, smoky and toasty garnishes accentuate roast and toast present in the beer while the creamy sweetness helps tame any astringency from darker, charred malts. 1. Make the soup. In a large stock pot over medium heat, melt butter. Add onion and garlic. Stirring occasionally, sweat until translucent, about 2-3 minutes. Add corn and salt. Cook, stirring frequently until corn is just tender and bright yellow. Remove from heat and transfer to a cool pot over an ice bath. 2. Add cold stock and lemon juice. Stir until mixture is evenly chilled. Working in batches, place in blender and run on high speed until soup is warm again, about 100–120 degrees. Without using a thermometer, a good indication that you have reached the desired temperature range is you can see that the small, white flakes of butter have dissolved back into the soup. 3. Strain through fine mesh or a colander lined with several layers of cheesecloth to achieve a smooth, creamy puree. Add salt to taste. Reheat and serve immediately, or refrigerate for up to two days. 1. Place the cilantro, garlic, lime zest, oil and pumpkin seeds into a food processor and pulse until all are very finely chopped. The mixture should be loose, not pasty and homogeneous. Fold in cheese and salt to taste. With a spoon, drizzle a small amount over each bowl of soup. 1. Heat a frying pan on medium-low. Add oil and pumpkin seeds. Toss frequently to avoid burning until seeds are puffed and evenly browned. Salt to taste and drain on a paper towel to remove excess grease. 2. To brown butter, add it to a small pan over medium heat and stir frequently until solids are a nice deep brown. Transfer to a cool dish or pan to prevent from browning further. The solids will sink to the bottom. To use your brown butter, first stir it back together and salt to taste. 3. Garnish each bowl with about a teaspoon of pumpkin seeds, several drops of brown butter, and a very small pinch of smoked paprika. A long time craft beer enthusiast, Paul Kasten has been cooking professionally for almost twenty years. In 2006, an internship brought him to Portland, Oregon, where he worked at the landmark farm to table restaurant, Wildwood. He began a series of high-profile beer pairing dinners in 2010, and in 2011 worked with Breakside Brewery to create the first beer in their chef-collaboration series. Wildwood closed in 2014, however Kasten is currently assembling a team to open a new farm to table restaurant in Portland with a strong focus on beer and beer/food pairing.